UraniumFree Virginia: Would You Like Virginia to Become the "Saudi Arabia of Nuclear Fuel"? Would You Like Virginia to Become the "Saudi Arabia of Nuclear Fuel"? The comment below is written in response to Professor Robert Bodnar's editorial "Why the Virginia legislature should lift the moratorium on mining uranium." You have presented an argument in favor of lifting the 1982 moratorium against mining and milling uranium in Virginia. Most of it is true, with the exception of the description of Virginia becoming "the Saudi Arabia of nuclear fuel." By most estimates, there exists enough uranium in the ground at the farm of Mr. Walter Coles, in Pittsylvania County, Virginia, to supply the existing nuclear power industry of the United States for nearly two (2) years. By their own estimates, this extraction process is projected to take as little as fifteen (15) years and as much as thirty (30) years to complete. This ore is then milled - that means it is pulverized to a "talcum powder" like dust, treated with sulfuric acid and other goodies, in concert with an immense amount of water to produce what is known as “yellowcake" or, uranium 238. Trouble is, that in order to render one (1) pound of U-238, worth about $42, it requires that one thousand (1000) pounds of ore must be dug out of the ground - and the leftovers are the nine hundred and ninety nine (999) pounds of highly radioactive tailings. These tailings are going to be radioactive for as long as a half - life of 4.5 billion years, in the case of uranium 238. The Santoy Resources website is full of pertinent information, and under the company prospectus for the COLES HILL project, their plan is to declare an area eight (8) miles from the center of each hole a "DEAD ZONE". Within this "DEAD ZONE" they expect to lose all groundwater and drilled wells. That water will no longer be potable. Amid all the hype about employment as a result of lifting the moratorium are the stark facts that the uranium mining industry employs less than five hundred (500) people in the entire United States. As well, there is nearly a 100% failure record on the part of the mining industry for being responsible for the clean - up of these sites. Nearly all have been abandoned by the industry and thus qualify, and gain the distinction of becoming "Toxic Waste Sites," funded by the American taxpayer. Mr. Bodnar, you have somehow overlooked all of the history of the catastrophic health and environmental results of uranium mining on the local residents and nature itself. In addition, you have not mentioned that radon gas is called "a daughter of uranium." That is, radon 222 only comes to us as a result of the decaying of uranium. What that means to scientists is that everywhere where there was a "radon scare" in the 1970s and 80s, there exists deposits of uranium. All through Appalachia from north Georgia, western North Carolina, the Piedmont foothills and Blue Ridge Mountains of Virginia, throughout the Shenandoah Valley, as well as all along the US-29 corridor. According to the United States Geological Service these deposits run up into central Maryland, southwestern Pennsylvania, and into Delaware and the District of Colombia. They even show what appears to be a huge deposit down in Greensboro, N.C. This is definitely an issue that will affect a much broader area than merely Pittsylvania Co. Professor Bodnar is mistaken. Virginia is likely to become a Saudi Arabia of yellowcake, not of nuclear fuel. 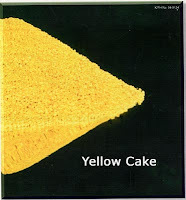 This is what uranium mines and mills produce - yellowcake, which is nothing more than a commodity that is traded on global markets and needs further processing to either become a fuel for nuclear power plants OR the building material for the weapons of mass destruction.